Being an avid thrift store/garage sale shopper, Rummikub is a game that I was quite familiar with despite never having actually played the game. Outside of games like Monopoly and Clue, Rummikub has to be one of the games that you find the most for sale at thrift stores. You could honestly go to ten thrift stores and I bet you could find Rummikub at close to half of them. This normally wouldn’t be a good sign as everyone ditching their copies of a game is not a reassuring sign. 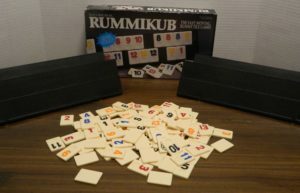 At the same time though Rummikub actually won the Spiel Des Jahres back in 1980 so there must be something to the game that appealed to voters. After such a long time of seeing the game and never playing it, I finally decided to give Rummikub a chance. For an older board game, Rummikub holds up surprisingly well for its age as a game that the whole family can enjoy. 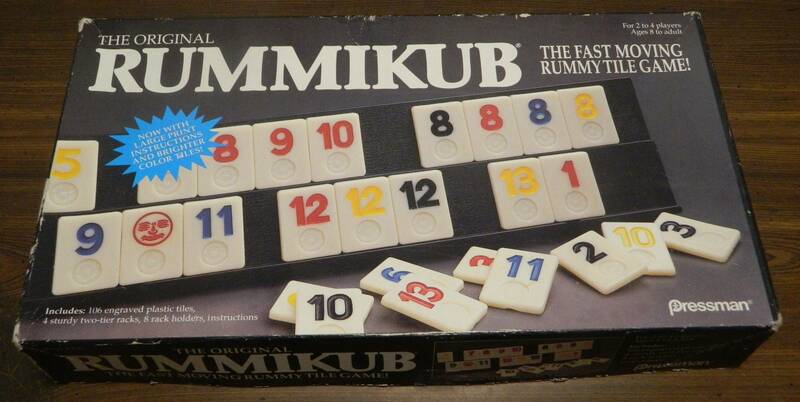 Before I begin I would like to point out that there have been quite a few different versions of Rummikub created over the years. While the basic rules are the same for all versions of the game, some minor rules do seem to be slightly different for some versions of the game. For reference the following rules are based off of the 1995 Pressman Toys version of Rummikub. Place all of the tiles face down in the center of the table and mix them up. All of the players will randomly draw a tile. Whichever player draws the highest valued tile will start the game. All tiles are returned face down to the table and are mixed into the rest of the tiles. Each player takes a rack. They will draw 14 tiles and add them to their rack. A group is a set of three or more tiles of the same number. Each tile in a group must be a different color. This is a group of three eights. A run is a set of three or more consecutive numbers. All of the numbers must be the same color. This is a blue run of tiles one through three. Jokers can be played as any number/color combination. This player used a joker as a blue four in order to create a larger run. Before a player can use any of the tiles on the gameboard, they must play sets to the table in one turn that equal at least 30 points. Tiles are worth the value of the number on the tile. Jokers are worth the value of the tile they are replacing. This player has played two sets. The group of three eights counts towards 24 of the 30 points needed to start the round. The run of one through five in blue counts as fifteen points towards the 30 points. This player played tiles totaling 39 points so they can start using tiles already on the table. Once a player has played their initial sets, they can start to building with the sets already on the table. They can add tiles to groups or runs as long as they don’t duplicate any of the tiles already in the group/run. They may also take tiles from sets already on the table to create new sets. They can combine the taken tiles with tiles from their rack or tiles from other sets. If a player takes tiles from a set, at the end of their turn they must make sure all of the sets are still valid and have at least three tiles in them. If at the end of their turn one or more of the sets are no longer valid, the player has to reverse all of the moves they made. They will also have to add three face down tiles from the table to their rack. If a player wants to take a joker from a set on the table, they must replace it with a valid tile for the set. The player then must use the joker with at least two other tiles from their rack to form a new set. With the tiles in their rack this player has a couple different options to use the tiles on the table. First they could take the five from the table and combine it with their blue four and six to create a run of four to six. The player could also replace the wild with their blue four and use the wild with their black twelve and thirteen to create a new run. If a player is unable to play any tiles on their turn, they must add one of the face down tiles to their rack. If the player draws a tile that they could play, they can’t play it until their next turn. Once a player has completed their turn, play passes to the next player clockwise. A round ends when one player is able to play the last tile from their rack. They call out “Rummikub” and play immediately proceeds to scoring. All of the players add up the numbers on the tiles remaining in their racks. The tiles are worth their face value with Jokers being worth 30 points. The players who still had tiles in their racks score negative points equal to the value of their remaining tiles. The player who won the round will receive positive points equal to the totals from all of the other players. The player in the front will score -26 points. The left player will score -45 points and the right player will score -21. The winning player will score 92 points. 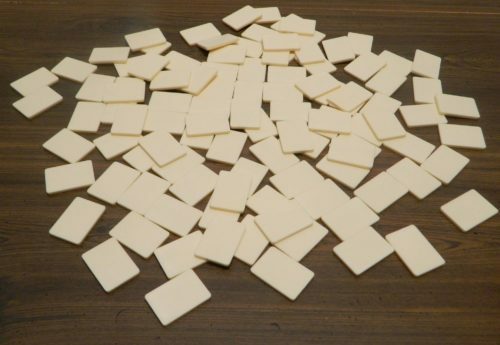 If all of the facedown tiles are taken before a player calls out “Rummikub”, the players count up the value of the tiles on their racks. The player with the lowest total wins the round. Players count up their points as described above. The amount of points in the winner’s rack is subtracted from the points in the other player’s racks to get their final value. After scoring is conducted, the next round begins. This is one of the areas where different versions of Rummikub seem to differ the most. Some versions of the game have you not reset tiles between rounds. The game ends when all of the tiles are used up and none of the players can play anymore tiles. Other versions of the game have you play an agreed upon number of rounds where all of the tiles are reset for each round. In either case at the end of the game all of the players will compare the points they scored in all of the rounds. The player who scored the most points wins the game. Before playing Rummikub I was concerned that the game felt like every other card game despite using tiles instead of cards. That is not surprising as the game is based off of one of the most popular card games of all time, Rummy. The basic premise of the game is very similar to most card games. Basically you try to get rid of all of your tiles. You do this by playing tiles in ascending numerical order or combining tiles of the same number. This tried and true mechanic is a favorite for a lot of card games for a reason. The mechanic is decent enough by itself but would get kind of boring on its own. The beginning of each round actually encapsulates this as it is usually quite drawn out and boring. Unless you get lucky with your initial draw of tiles, most players will not be able to play any tiles on their first turn as they weren’t dealt valuable enough sets to get rid of 30+ points of tiles. This usually leads to several rounds where players draw a tile and pass their turn to the next player. For this reason the beginning of each round of Rummikub moves quite slowly. Things change drastically once two or more players play their first set of tiles. This is where Rummikub really starts to shine. Unlike a lot of games where you can just play sets from your hand, once you have played your initial set(s) you can utilize all of the tiles already on the table. You can mix and match tiles however you like. The only rule (outside of Jokers) is that all of the sets have to be valid at the end of your turn. This really opens up your options in the game as you can come up with some creative ways to move around tiles to get rid of the tiles from your rack. The reason why Rummikub works as well as it does is that this mechanic is so satisfying. The mechanic is so simple and yet it adds so much to the game. There is a lot of luck to the game (which I will get to later), but this mechanic adds a decent amount of strategy/skill to the game. One key to doing well in Rummikub is seeing patterns in the tiles on the table and manipulating them in order to get rid of tiles from your rack. It is so satisfying when you are able to move around a lot of tiles on the table in order to get rid of tiles from your rack. You might not be able to play a lot of tiles early in the game, but by the end you can have a turn where you can get rid of a majority of the tiles in your rack. Outside of mixing and matching the tiles being so satisfying, I think one of Rummikub’s greatest strengths is the game is quite accessible. Basically all you need to know to play the game is basic numbers (1-13) and color recognition. After that the rules are quite easy to teach where younger children and people who don’t play a lot of board games shouldn’t have any problems with the game. Some players may not be able to see all of the potential moves they could make to get rid of tiles, but they should still be fine playing the game. I am always appreciative of board games that are made only as difficult as they needed to be. This describes Rummikub quite well. For a player’s first round or two of Rummikub I would probably recommend dropping the time limit for turns. This allows new players some time to adjust to the game and figure out how to manipulate the tiles on the table. I would highly recommend eventually implementing the time limit though. Without the time limit players with analysis paralysis will grind the game to a halt. Especially later in a round there are so many different possibilities when it comes to manipulating the tiles on the table. Players will want to try every possible combination before they end their turn by drawing a tile. If players take a long time on their turns, the game begins to feel like it will never end. Therefore a time limit forces them to accept a sub-optimal move. The time limit given in different versions of the game can differ but most have the time limit at two to three minutes. That seems about right but if you want more time you could move the time limit up to five minutes. I wouldn’t go any further though or each round could take forever. I have to admit that I didn’t have high expectations for Rummikub heading into playing it. I was genuinely surprised by it though. It is far from the best board game that I have ever played but it has held up surprisingly well for its age. It is not as good as quite a few designer games released today, but it is one of the best games created in 1977. I would say that there is one main issue with Rummikub. Not surprisingly the game relies on quite a bit of luck. As you have no control over what tiles you end up drawing (unless you cheat), your fate is somewhat determined by which tiles you end up drawing. Your skill/strategy doesn’t really matter if you don’t draw the right tiles. You want to draw tiles that can be combined with tiles already in your rack or tiles that are already in sets on the table. In particular you are probably better off drawing numbers towards the middle as it is quite a bit harder to utilize low and high tiles. If you have luck drawing tiles you will do well in a round. If you draw poorly you are going to have a hard time winning. This draw luck can be worse in Rummikub than other similar games. As you have to place at least thirty points in your first group of sets, if you aren’t dealt the right tiles you are going to have a hard time winning a round. You could be stuck trying to play your own sets while other players are already adding most of their tiles to sets already on the table. It is theoretically possible that a really unlucky player might not even be able to play any tiles in a round before it ends. In this case you would lose the round due to no fault of your own. 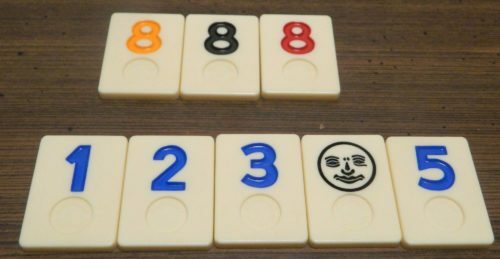 The other smaller complaint with Rummikub is with the components. The component quality is really going to depend on which version of the game you purchase. You mostly are just getting tiles so the component quality depends on the quality of the tiles. The main issue with the components is that you don’t really need a copy of Rummikub to play Rummikub. As the game is based off of a card game, it is only natural that you could play the game with cards. If you don’t want to purchase a copy of Rummikub you could easily play the game with just two standard decks of playing cards. This would be a bigger deal except that is not hard to find a cheap copy of the game. 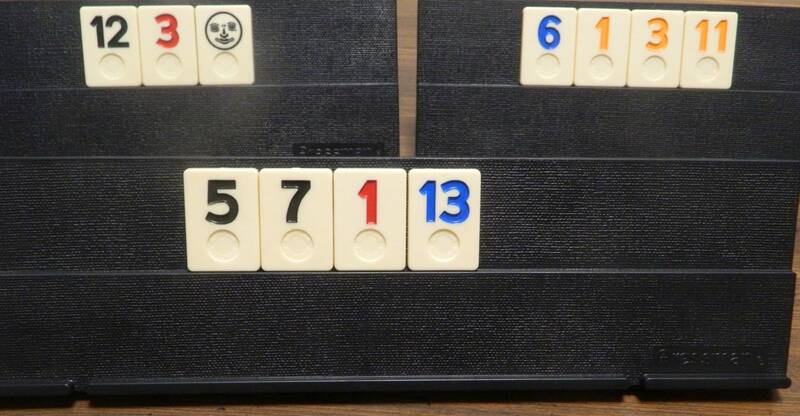 I might have exaggerated things a little at the beginning of the review but it is not that difficult to find a copy of Rummikub at a thrift store or rummage sale for a couple dollars. After seeing Rummikub at thrift stores and rummage sales for many years, I can’t say that I had high expectations for the game. Board games have changed a lot in recent years which means most older board games don’t hold up anymore. I was genuinely surprised that Rummikub holds up really well. 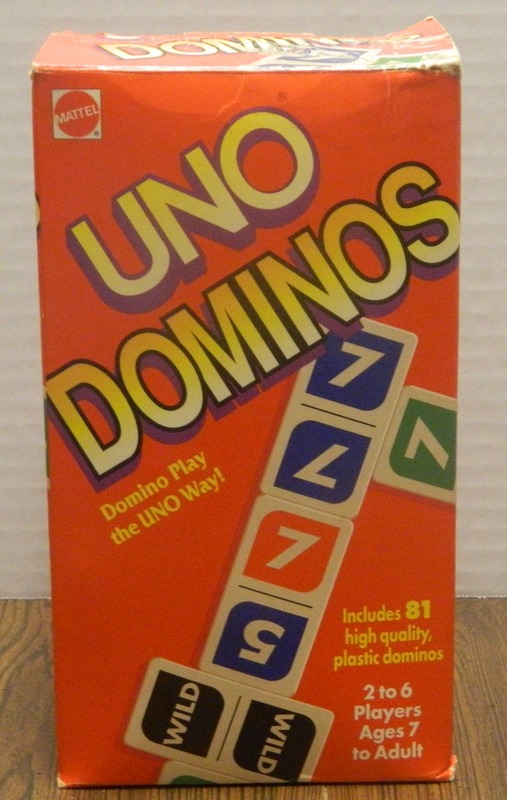 The basic gameplay of playing tiles/cards in sets has been used in quite a few other games. 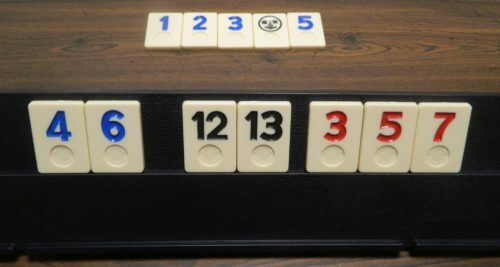 What makes Rummikub unique though is the ability to then rearrange the sets on the table with the tiles in your rack to create new sets. This gives you a lot of options for playing tiles to the table. When you add in that the game is accessible for the whole family it is hard not to like Rummikub. The only significant issue with the game is that the outcome relies on a lot of luck. Whether you should purchase Rummikub depends on a couple factors. If you have never been much of a fan of games where you play matching cards/tiles, you probably won’t like Rummikub. If the concept interests you though I think you will really like Rummikub. People who want to save some money could easily play the game with two decks of cards. As you can find the game for pretty cheap though, this isn’t a big deterrent to purchasing the game. Unless the game’s concept doesn’t really appeal to you, I would highly recommend picking up Rummikub. Being able to manipulate the tiles on the table along with your own tiles is surprisingly fun. Relies on a lot of luck. Can easily be played with two decks of playing cards.